As viral images, the so-called “spomeniks” of the former Yugoslavia are often taken out of context. The road winds upwards through pine forests, eight miles of twists and turns, before it eventually emerges into a clearing at the highest point of Petrova Gora. There, a series of ruined buildings, the shells of a former visitor center, sit abandoned in the shadow of a silver-blue titan. This undulating concrete giant, clad in scales of stainless steel, is the Monument to the Uprising of the People of Kordun and Banija, a memorial that rises 120 feet high at the mountain’s peak. In most any other town or city in the world, it would make for an extraordinary landmark, a truly unique structure both in size and design. But here, lost in a sea of rolling green mountains and forests, the building is all the stranger for its loneliness. The memorial house on Petrova Gora is one of many hundreds of unusual, oversized monuments that were built by the former Yugoslavia during the 1960s, ‘70s and ‘80s across the Balkan States. These Yugoslav war memorials—often dubbed “spomeniks” by Western media—have gained a lot of online attention in recent years. However, as viral images, they are increasingly taken out of context. 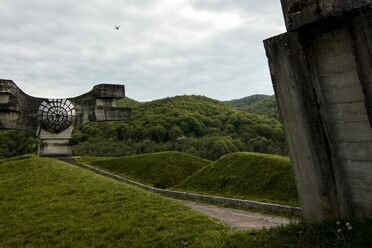 The monuments are often described as “abandoned” and “forgotten,” or lumped under the catch-all title of “communist monuments.” In reality though, these abstract designs expressed more than mere political affiliations, and many still serve their communities in the same roles they were built for. Few of the spomeniks are forgotten; “orphaned” might be a better word. They stand like children of a vanished state now scattered as memory markers across a post-Yugoslav Balkan landscape. These monumental structures were raised to commemorate the terrible battles, mass executions, and concentration camps that scarred the Balkans during World War II. They commemorate the victims of the long conflict between Yugoslav partisans and the occupying Nazi forces that local histories refer to as the National Liberation Struggle. With their wild and futuristic shapes, the monuments, by design, also looked relentlessly forward to the future. Depicting rockets and towers, fists, flowers, stars and wings, these steel and concrete monoliths didn’t dwell on images of suffering, but rather symbolized broader themes of anti-fascist struggle and the victory of life over death. Instead of focusing on individuals—a Bosnian hero, a Serb or a Croat—the monuments of multiethnic, socialist Yugoslavia were also designed to celebrate universal ideals. “Brotherhood and Unity” became the slogan of post-war Yugoslavia, and the abstraction of these monuments was a gesture of inclusivity. Often, the monuments were formed from multiple segments that rose together without touching, and yet which, from a distance, might be viewed as one single object, an allegory for Yugoslavia itself. While some sources suggest this movement in monumental architecture was centrally coordinated by the Yugoslav powers, even by then-president Josip Broz Tito himself, the truth is that many of these memorial sites grew out of local-level initiatives. They were often created by workers’ collectives, cultural institutions, and architecture competitions. Some projects were approved for funding by the governments of Yugoslavia, and some were even visited by President Tito. But in other cases—the memorial park on Bosnia’s Mount Kozara, for instance—the monuments were raised using voluntary donations alone. In their heyday, the Yugoslav memorial sites formed a physical network of education and memorialization centers, spread out across the six republics (Serbia, Croatia, Slovenia, Bosnia & Herzegovina, Montenegro, Macedonia) and two autonomous provinces (Kosovo and Vojvodina) that formed the union. They charted the course of the National Liberation Struggle, one battle at a time, recording the places where Yugoslav people had sacrificed, suffered, or accomplished incredible deeds. Often the memorial complexes were fitted with museums or lecture theatres, and busloads of school children would visit as part of their historical curriculum. These places thrived as centers for education and remembrance—right up until the country that created them fell apart. Yugoslavia died in the 1990s, a slow, painful death after the Yugoslav brand was hijacked by Slobodan Milošević and his Serb nationalists, and one republic after another broke away in favor of independent government. The monuments became unwelcome symbols of the union of Yugoslavia in the countries where people were now fighting to be free from Yugoslav rule. As a result, many of these memorial sites were destroyed. Once upon a time, Yugoslavia had the largest postmodern sculpture anywhere in the world: a 100-foot pair of abstract wings, the Monument to the Victory of the People of Slavonia, at Kamenska, in modern-day Croatia. It had taken more than 10 years to build, but in 1992, in the heat of the Croatian War of Independence, the army used dynamite to bring this Yugoslav symbol to the ground. Many others would follow. Of the thousands of abstract monuments that once dotted the mountains and cities of Yugoslavia, only a fraction remain today. Those that weren’t leveled in the wars as symbolic targets for anti-Yugoslav sentiment were in many cases neglected, graffitied, or vandalized after. But then, after decades of use and adoration, followed by decades of damage and decay, a strange thing happened to these monuments. The internet found them. The Belgian photographer Jan Kempenaers brought the Yugoslav memorials to the National Liberation Struggle into the global spotlight in 2010. He published a collection that detailed a series of sad-looking shapes standing forlorn in fields and mountain landscapes, which quickly ignited an interest around the world. Kempenaers’ book was titled Spomenik, borrowing the Serbo-Croat word for “memorial.” Other media outlets followed suit, and the term “spomeniks” is now commonly used to describe these structures. The Yugoslav monuments are inherently political though, and for some people in the region, the foreign-given name is problematic. In an English-language context the word sounds exotic, alien, and critics say its use risks otherizing and exoticizing them. More than that though, the visual language of Kempenaers’ Spomenik invited sensationalism. The images made these places look despondent—colors faded down, visitors kept carefully out of shot—so that the headlines almost wrote themselves: “Abandoned Communist Monuments.” Very few of the surviving Yugoslav monuments are, in fact, abandoned. The “Ilinden Spomenik” in Kruševo, Macedonia, contains a vividly colorful museum charting local revolutionary history. The sites at Kozara and Tjentište, in Bosnia and Herzegovina, have functional museums too (though these are typically opened only on request). At Jasenovac in Croatia, where the “Stone Flower” monument watches over the site of a former concentration camp, a museum complex hosts annual remembrance gatherings where many hundreds of attendees swarm through the park on the anniversary of the camp’s liberation. In Serbia, meanwhile, the memorial sites at Kruševac and Kragujevac continue to attract scores of domestic tourists and survive as powerful symbols of Serbian national identity. Even at the smaller sites, the lesser visited “spomeniks,” evidence of modern use can often be found in the form of flowers, wreaths, and candles. The Balkan region is not wealthy. Many hundreds of lived-in houses are still marked with bullet-holes from wars that took place a quarter of a century ago. In such circumstances, it’s wrong to assume that a monument is not valued simply because it is not maintained. Near Sisak in Croatia, there is a grove in the forest where the nation’s first anti-fascist partisan detachment was formed. Visit the place today and it will feel remote, a lonely tower amid the trees, and words like “forgotten” or “abandoned” spring quickly to mind. But bouquets of fresh flowers, laid on an engraved stone, tell a different story. The Sisak monument, a cluster of concrete fingers rising together into a tubular tower, has been repainted in recent years. 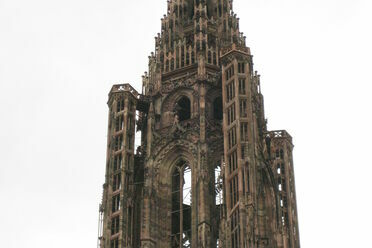 The front of it is clean and white, while the sides of the monument, and rear, show faded grey concrete. It appears that whatever local group still cares for this place, they couldn’t afford to paint the structure in its entirety. Instead, they have created an illusion: stand in a certain place, and seen from just the right angle this anti-fascist memorial is still as hopeful, as optimistic, as it ever was. Here is a map of 16 places to visit the “spomeniks” of former Yugoslavia. Darmon Richter is a British travel writer and Ph.D. researcher, with a particular interest in the ideological architecture of Eastern Europe. He writes The Bohemian Blog, and will lead Atlas Obscura’s Past Future Monuments of the Balkans trip this spring. The Casa Italiana has a complicated history on Columbia University's campus.